Welcome friends. I’m excited that I get to do the Friday Fill Ins this week. It’s been snowy and cold at our house. Thank goodness the humans provide wheat grass for us to nibble on and to add a bit of color in this white world. 2 My favorite fast food restaurant is any place that serves pizza. All of the Tribe of Five love a nice lick of pizza sauce. 3. If I could go to any concert of someone still performing, it would be wherever David Teie is playing his Music for Cats The female human bought us some of his music and we loved it. You can read about us opining about it on our website . When we go to the place with white coats, they have nice cat music too. Music is good for kitties. 4. My Winter pastime is usually sitting at the window and checking out the creatures who come by looking for food because what happens outside our windows is like cable TV. 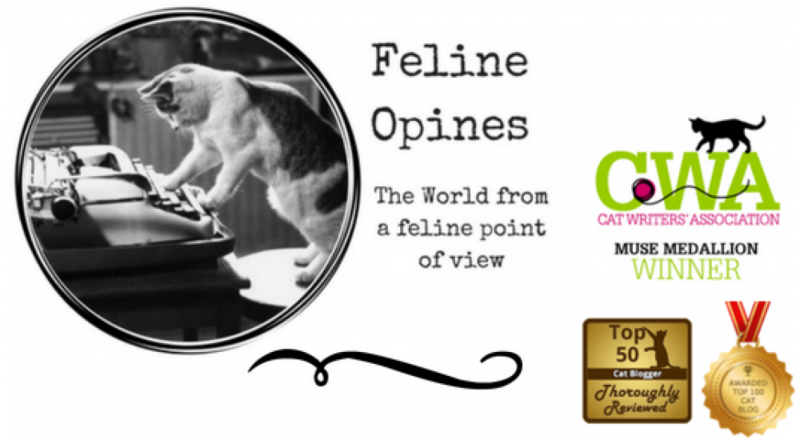 This entry was posted in cat behavior, Cat blogs, Cat music, Cat writers, cats, Pet blogging, raccoons, Squirrels and tagged cats and music, cats and wheat grass, cats watching wild life, Feline Opines, music for cats, The Tribe of Five by Feline Opines. Bookmark the permalink. Why thank you so much, The Tribe of Five love opining about things! And thank you for the compliment! Thank you for the compliment! Yes, we have quite a number of critters that come to our house. That squirrel is a bully. He tries to muscle out the little pine squirrels that come to the feeder but they’re pretty feisty. Never a dull moment at our house. This was very enjoyable. We like some of the same things, too…like pizza and watching animals. Hugs! Wow, I bet those raccoons provide a lot of good TV time! They are quite amusing and the female human always gives us a little of the food she feeds them so everyone gets a treat! Oh, Jasmine … you are a STUNNER! Why thank you so much, the diva in me has to agree!